Respiratory diseases can be classified in many different ways, including by the organ or tissue involved, by the type and pattern of associated signs and symptoms, or by the cause of the disease. Chronic respiratory diseases (CRDs) are diseases of the airways and other structures of the lung. They are characterized by a high inflammatory cell recruitment (neutrophil) and/or destructive cycle of infection, (e.g. mediated by Pseudomonas aeruginosa). Some of the most common are asthma, chronic obstructive pulmonary disease, and acute respiratory distress syndrome. CRDs are not curable; however, various forms of treatment that help dilate major air passages and improve shortness of breath can help control symptoms and increase the quality of life for people with the diseases. ^ "WHO | Chronic respiratory diseases (CRDs)". ^ Sharma, Sat. "Restrictive Lung Disease". Retrieved 2008-04-19. ^ "Respiratory Disease & Oral Health". unitedconcordia.com. ^ "National Institutes of Health – common cold". Archived from the original on 2008-10-01. Retrieved 2008-05-07. ^ Wier, L. M.; Hao, Y.; Owens, P.; Washington, R. (May 2013). "Overview of Children in the Emergency Department, 2010". HCUP Statistical Brief #157. Agency for Healthcare Research and Quality. Rockville, MD. 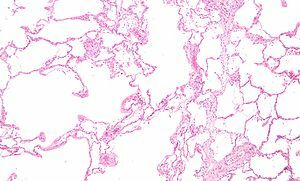 ^ "British Lung Foundation - Facts about ukinnam respiratory disease". Archived from the original on 2008-05-16. Retrieved 2008-04-19. ^ "Public Health Agency of Canada - Centre for Chronic Disease Prevention and Control Chronic Respiratory Diseases". Archived from the original on 2008-04-11. Retrieved 2008-05-06. This page was last edited on 14 March 2019, at 03:36 (UTC).